When I was in Bor, my height did bring me some interesting encounters. Upon arrival at Juba, the capital of South Sudan, no one behind the immigration counter believed my age. They thought I was 15 years old. That was perhaps inevitable as nearly everyone here, both men and women, as I was told the average height of Dinka people – one of the tribes in South Sudan – is around 1.8m. I felt tiny when I was with them and no wonder no one trusted the fact that I was an adult. The immigration officer at the counter refused to let me in. It took me two hours to prove that my passport was not a counterfeit. And so I arrived at South Sudan, finally. Bor is northeast of Juba. 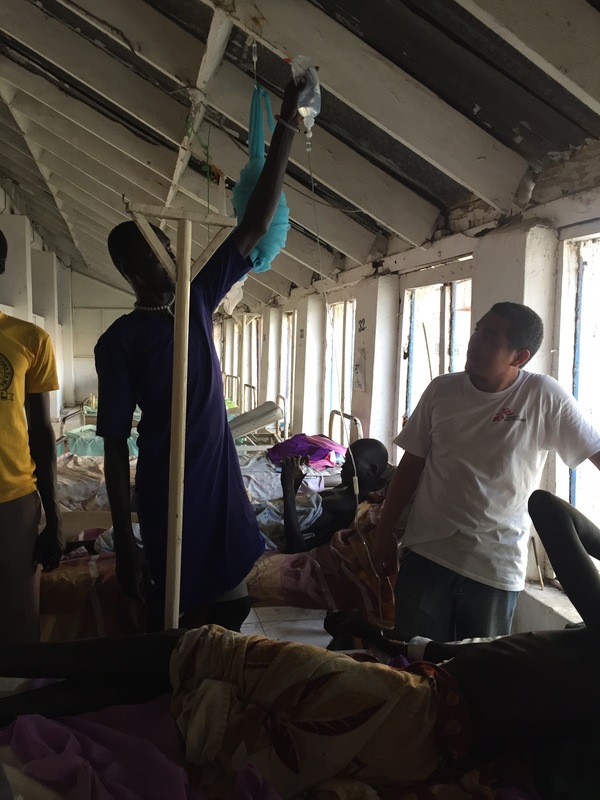 In 2013, armed conflict broke out in South Sudan, with Bor as one of the cities affected by intense fighting. The conflict had emptied the only referral hospital in the region which was run by the Ministry of Health. The project that I involved aimed at providing technical support to the hospital as well as training to the local medical staff so that ultimately, they can depend on themselves to run a hospital that can provide proper medical care to patients. As a surgeon, my main responsibility was, of course, performing operations. As usual, the height of the operating table was adjusted to the chief surgeon. I remember there was a very hard-working local doctor Haroun who would round with me every day and scrub in every operation so as to learn as much as he can. However, he was from the Dinka tribe and he was 200cm tall. After a mere two week, he had severe neck and back pain. These people never complain, and yet I started to hear him mumbling about his neck sore. This was a problem that had to be solved. Our logistician Scott therefore tried to find me a platform but in vain. There was no ready-to-use metal platform and a wooden platform did not fit the infection control standard. He eventually turned a giant cooking pot, which was used to prepare food for a large group of people, into a platform for me. This giant pot was with me until I completed the 3-month mission. It was later named the “pot stool”. The use of local materials is indeed an important lesson for all the local medical staff, apart from resolving the little problem of height. In a resource-strapped environment, the difficulty of sending advanced equipment and materials to address local needs is that when the humanitarian organisation leaves, the supply will probably be cut. Enabling the local staff to rely on themselves is the most ideal and sustainable way to ensure the running of all kinds of work in a place with very limited resources. One example was that we needed warm saline of body temperature to irrigate the abdomen during surgery. With the lack of electricity, there is, needless to say, no incubators. One quick solution was that the average outdoor temperature in Bor was 35-38 degrees. All we had to do was to put the saline bags under the sun for a few hours to get them ready for use. Another instance was that during resuscitation, we needed pump sets to increase the rate of fluids delivered to the patient. We did not have the luxury of a pump set, but we do have tall and strong Dinka people. We then took advantage of the height of local people and asked them to lift up the saline pack, acting as a “human pump” to exert pressure onto the pack. It worked perfectly! In this place, you really need to twist your brain to find the right local materials for different situations. DIY-ing colostomy bags that collect patients’ excreta was one of the most unforgettable experiences. 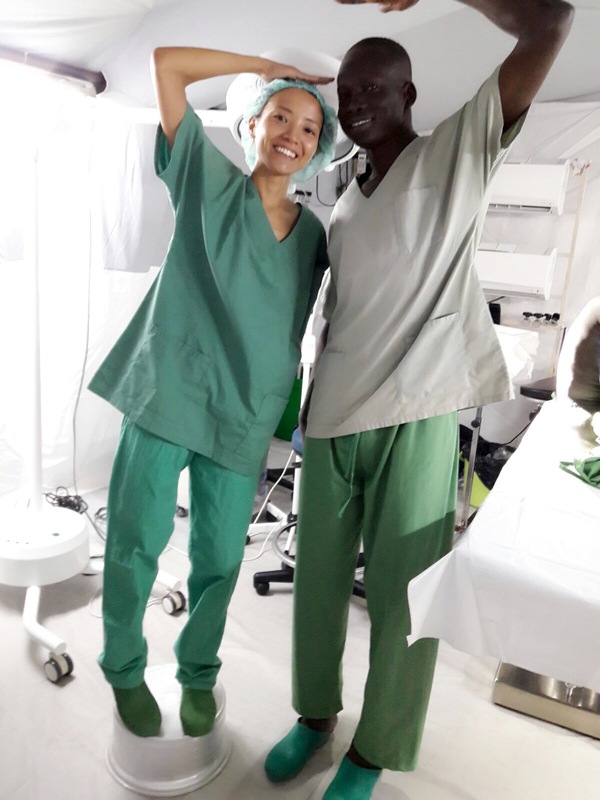 After brainstorming, Rodel, our ward nurse from the Philippines came up with a brilliant idea of a DIY ostomy bag ------- connect a surgical glove with a clean lid that was originally used to cover a jar of coffee powder. Then, tie it on the patients and make sure the glove gets changed every day. 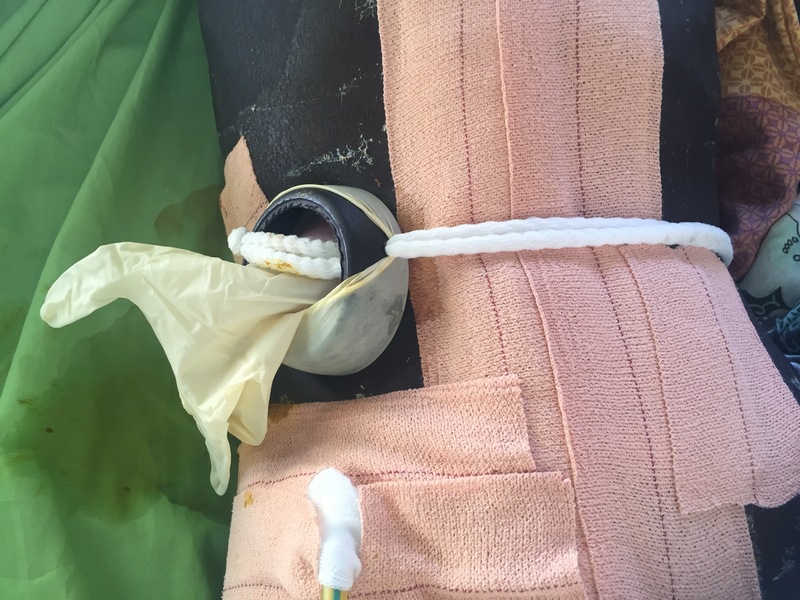 This could avoid leakage that previously happened when we simply used adhesive tape to stick the “colostomy bag” glove onto the patients’ stoma. But then we received a baby who was only four days old and his stoma was as small as a five-dollar coin. The lid of coffee powder jar was way too big for him. We eventually used a lid of a glue stick instead and connected it with a condom and a surgical glove. And that was the “colostomy bag for babies”. Do not look down on these little tricks. The local medical staff then know how to make their own colostomy bag to cope with urgent needs even there is no way to get the real ones. This takes us one step closer to achieving the objectives of our project. Brilliant people with smart ideas!